CIRCLE THIS AD. Located within walking distance of Ipswich town centre lies this stunning, modern two bedroom upper floor apartment. Register your interest early and call Northwood on 01473 299070. 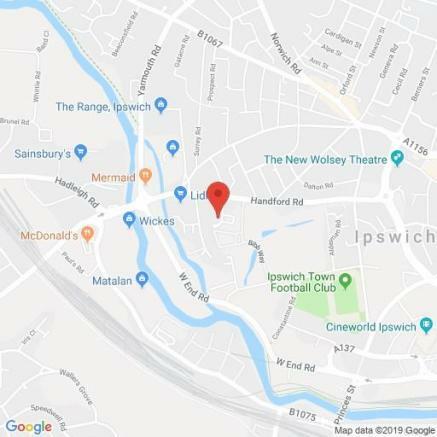 Situated within easy reach of a host of local amenities such as retails parks, pubs and restaurants, supermarkets and Ipswich Town Football Club, this extraordinary home is ideal for a single professional or couple and also offers very convenient access to the A14 and A12. Internally comprising of a spacious lounge/diner with juliette balcony, modern fitted kitchen, bathroom and two double bedrooms. To the rear of the building there is one allocated parking bay. The property is available in a part furnished condition consisting of a dining table and chairs in the lounge and a divan bed in the master bedroom though upon negotiation can be removed. Available for let from late March - Call Northwood to view on 01473 299070. The rental cost does not include bills, these are payable separately and are the tenants responsibility. Intercom system. Stairs to upper floors. Doors to bathroom, bedrooms and lounge. Storage cupboard. Wall mounted intercom phone. Radiator. Suite comprising of bath with shower over, low level WC and pedesatl wash basin. Radiator. Window to rear aspect. Fitted carpet. Window to rear aspect. Built in wardrobe. Radiator. Fitted carpet. Window and radiator to side aspect. Range of wall and base units with integrated oven, gas hob and extractor over. Freestanding washing machine and fridge freezer. Window to front aspect. This property is marketed by Northwood, Ipswich at £595 per month. Rightmove has calculated the price per week for comparison purposes only. Property reference 307. The information displayed about this property comprises a property advertisement. Rightmove.co.uk makes no warranty as to the accuracy or completeness of the advertisement or any linked or associated information, and Rightmove has no control over the content. This property advertisement does not constitute property particulars. The information is provided and maintained by Northwood, Ipswich.